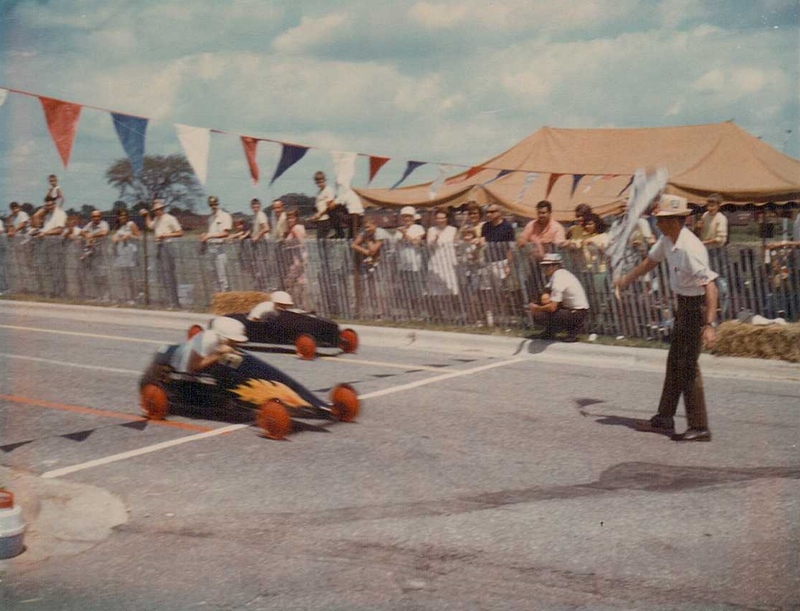 The photo from the Soap Box Derby is from my former next door neighbor. He sent it after we shared some memories at our high school reunion in September. Look at how the adults are dressed! Not a pair of jeans in site and the women are all in dresses. Don’t you love the hats? It was 1969 and just so Americana. What does it have to do with sewing? Well, the car crossing the finish line first is my neighbor and the paint job (done by my mother) inspired the car for the next year, along with a crazy flurry of bikini making. Flaming Tiger was the name of his car in 1970 and someone came up with the insane idea for the neighborhood girls to attend the derby, cheering on this poor boy, wearing tiger skin bikinis. Please understand, we all lived on a lake and bikinis were basically our summer wardrobe, but looking back, I’m amazed we and our parents thought this was a good idea. Anyway, try finding tiger skin fabric, in the summer, in a pre-knit decade. The only fabric to be found was terry cloth, so yes, we made bikinis out of the most absorbent fabric possible. Good thing we did not plan to swim in them. Of course we were doing all this the day before, working late into the night, and as everyone knows, sewing while sleepy guarantees mistakes. I made one that lead to a new nickname, Cyclops. The bikini top had cups that should have been seamed together in the front then attached to the two sides which hooked in the back. Somehow I managed to sew the two sides to one cup. So I had a one cup (Cyclops) bikini top. At least it was a quick fix and the laughter gave us the energy we needed to get the job done. I’m the one in the tennis shoes, standing pigeon-toed because I had stepped on a bee. Yeah, it was that kind of day. It was a little low, but it stayed in place. Good thing, my date was irritated enough. I still loved the dress in spite of it all.